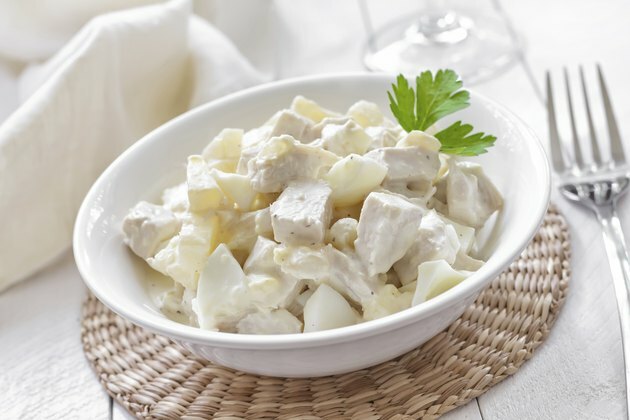 Cooked, cubed chicken is a staple of recipes from all-American casseroles, soups and salads to Asian stir-fries and Latin American empanadas. Chicken cooks fairly quickly and needs little tenderizing, so cooking cubed chicken takes very little time and effort. There are many methods available to cook cubed chicken, but the quickest, simplest and most effective way is to pan-fry it. Cooking the chicken quickly over fairly high heat keeps it juicy, tender and ready to be added to your favorite recipe. Fill the bottom of a skillet with just enough olive oil to coat it. Olive oil is full of heart-healthy omega-3 fatty acids, but it is still a fat, so use a light hand when pouring it. Heat the olive oil over medium-high heat until it starts to shimmer and release its scent. Add your raw cubed chicken to the pan all at once. Stir the chicken cubes to coat them with the olive oil. Season them with coarse salt and cracked pepper to taste. Stir and cook the chicken for 6 to 8 minutes or until they are golden brown on the outside and an instant-read thermometer reads 160 F when inserted into a random sampling of the cubes. When cubing the chicken, keep the pieces uniform in size so they all cook at the same rate. Add chopped onion and minced garlic to the hot oil for more flavorful cubed chicken. Never guess at whether your cubed chicken is cooked to a safe temperature; always use a thermometer.